Preferred Risk Administrators provides employer groups immediate access to healthcare for their employees and enrolled family members through First Stop Health’s telemedicine program. First, the employee avoids paying an out-of-pocket copay or deductible for seeing a doctor. Second, they also avoid all of the hassle involved scheduling an appointment and making a trip to the doctor’s office. Preferred Risk Administrators has partnered with First Stop Health to begin offering a new telemedicine service to employer groups across the county. 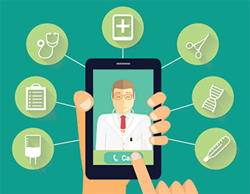 Telemedicine is a service that allows a member to speak with a physician over the phone 24 hours a day, 7 days a week. There is no copay, deductible, or any other out-of-pocket expense for the member to pay for using the service. For certain illnesses, the physician is typically able to make a diagnosis over the phone and call in a prescription directly to the member’s pharmacy of choice. “The First Stop Health telemedicine program also benefits employer groups, as it reduces the time an employee has to be off work to visit a doctor, while self-insured employer groups have even more savings realized on their self-insured plan by avoiding unnecessary doctor office visits,” Dial explained. The First Stop Health telemedicine service works by a member either calling the telemed phone number or entering their request online. A U.S.based, First Stop Health licensed physician, will contact the member in an average of under five minutes. Next, the physician and the member will discuss the symptoms the member is currently experiencing. When possible, the physician makes a diagnosis right over the phone and can order a prescription and/or give other treatment advice. Preferred Risk Administrators is headquartered in Bedford Park and provides a wide range of Third Party Administrator (TPA) services. Whether you’re an individual or group carrier, or a self-funded group, Preferred Risk Administrators has what you need. For more information on the First Stop Health telemedicine program, contact Bob Dial at 708-475-6051 or RDial(at)PreferredRiskAdmin(dot)com.